TONIGHT: Tuesday, Jan. 30, the Lady Railers plays Taylorville at home. Varsity game begins at 7:30. 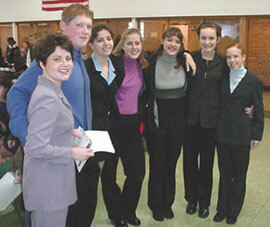 Part of the LCHS speech team. From left to right: Tristan Lemme, Beau Hanger, Carly McLean, Laura Baker, Allison Leonard, Colleen Fitzimmons, Kerry Dobihal. Reminder: American Red Cross blood drive Wednesday, Jan. 31, at Mount Pulaski Christian Church from 11 a.m. to 5 p.m.